The FIH (International Hockey Federation) have published the new Rules of Indoor Hockey, which will take effect internationally from 1st January 2017. Before we read more about the rules changes, check out the 2017 Indoor Hockey rules video briefing by Steve Horgan, the director of Umpiring for USA. 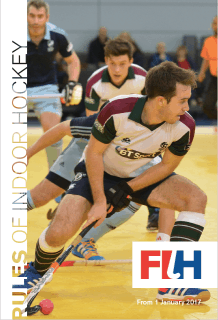 Download the Rules of Indoor Hockey 2017. There are a number of changes to the Indoor Rules. These are all indicated by a vertical line at the left side margin against the relevant text in the Rule Book. They are summarised below, but players, coaches and umpires are encouraged to read the full text of the new rules rather than relying on this post. If the post below contain error(s) or misinterpretation, please let me know and I will amend it accordingly. Rule 4.2 – This change tidies up the definitions of what protective equipment field players can wear to defend Penalty Corners (PCs). It includes the stipulation that hand protection must fit in an open-ended box of internal dimensions 290mm long x 180mm wide x 110mm high. The Rule change also makes it clear that players can wear knee pads outside their socks for protection provided that their colour is exactly the same as the colour of the socks. Knee pads that do not match the player’s sock colour must continue to be worn under the socks. Rule 7.4 – This sees the introduction of the new style “long corners” indoor. So, if the ball crosses the backline without a goal being scored after it has been played unintentionally by a defender, or deflected by a goalkeeper or player with goalkeeping privileges (PwGKP), play is re-started by an attacker with the ball on the centre-line and in line with where it crossed the back-line. The normal procedures for taking a free push apply. Rule 9.17 – This introduces the guidance that if the ball hits PC protective gear that has been carelessly discarded by a defender after a PC, play is restarted with either a free hit to the attack, if the item is on the pitch outside the circle, or a PC, if the item is inside the circle. Rule 13.2 – This rule has been amended to clarify what procedures apply for attacking free pushes taken in the half that the team is attacking, bringing the Indoor Rules into alignment with the 2015 Outdoor Rules concerning attacking free hits within the 23m area. Specifically, amended Rule 13.2.e clarifies that when taking a free hit in the half that they are attacking the attacking team must ensure that the ball travels at least 3m, or be touched by a defender, before being played into circle; or that the ball must travel 3m before hitting the sideboard and rebounding into the circle. Rule 13.8.e – This change makes it clear that the player defending a penalty stroke (PS) cannot move their feet once the whistle has been blown to start the PS until the attacker actually plays the ball. Rule 14.1.b & 14.1.c – This introduces the one minute suspension for a green card into the Rules, meaning that it is no longer necessary for this to be specified in relevant tournament / competition regulations and that it must be applied in indoor hockey at all levels. Rule 1.8 – No items inside the goal: minor change replacing the word ‘gloves’ with ‘hand protectors’. Rule 2.1 – Clarification that if a team has too many players on the pitch a previously made decision can now be changed if play / time has not been re-started. Rule 2.2 – Clarification that a change in the player who is the nominated PwGKP is a substitution, so, by definition, the PwGKP cannot be changed after the award of a PC until such time as the PC is completed. Rule 4.3 – Removal of the requirement that goalkeeper tops should be a single colour. Rule 7.2 / 7.3 – Clarification of the restart procedure if the ball goes outside the pitch. Rule 9.8 – Very minor clarifications of what is dangerous (the addition of the word ‘also’ in the first paragraph of the guidance and of ‘or stationary’ in the third paragraph of the guidance). Rule 11.4 – Very minor change, in that the words ‘of warning’ are deleted from those things of which umpires must keep a written record. Rule 13.7.c – Clarification of what happens if a defender crosses the back-line or centre line at a PC. Rule 13.10.d – No material change, other than the word ‘warning’ has been adjusted to ‘caution’ as a result of the green card becoming a one minute suspension. Appendix 2.3.c – It is not acceptable for players to abuse opponents, umpires or other technical officials verbally or through body language and attitude. Umpires MUST deal firmly with abuse of this sort and in appropriate circumstances issue a caution, or a temporary (green and yellow cards) or permanent (red card) suspension. Cautions and suspensions can be given in isolation or in combination with another penalty. Appendix 4.3.b – Ball out of play over the back-line by an attacker :face the centre of the pitch and extend both arms horizontally sideways. Appendix 4.3.c – Ball out of play over the back-line unintentionally by a defender : using right or left arm as appropriate, with the arm well below shoulder level, draw an imaginary line from the point where the ball crossed the back-line to the point on the centre-line from which the re-start should be taken. This document of FIH Indoor Hockey Umpires Briefing 2017 might be helpful for Umpires.